The chair of the Independent Police Complaints Commission (IPCC) Dame Anne Owers said today that she has apologised to Baroness Doreen Lawrence and Neville Lawrence, parents of murdered teenager Stephen, for the police watchdog's part in prolonging the "family's search for the truth". Commander Richard Walton has been temporarily moved from his post as Head of the Counter Terrorism Command, SO15, to a non-operational role, following the publication of the Ellison Report, Scotland Yard said today. The Metropolitan Police said it had voluntarily referred the matter to the IPCC. Metropolitan Police Commissioner Bernard Hogan-Howe has said the publication of yesterday's Ellison Report was one of his "worst days" he has seen as a police officer. 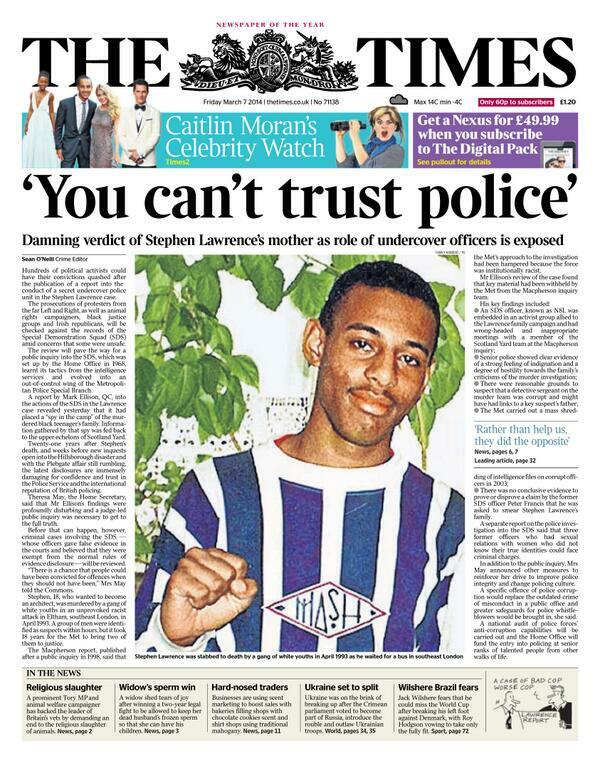 The report concluded that evidence of police corruption had been found in the case of murdered black teenager Stephen Lawrence. Mr Hoga-Howe told The Evening Standard: "This was a devastating report for the Metropolitan Police and one of the worst days that I have seen as a police officer. “To see Neville and Doreen Lawrence struggling through their tears was awful. The Met has come to know them well and I have enormous respect for their quiet dignity and powerful determination to see justice, which I share. Two men convicted of arson attacks on department stores will ask to have their convictions quashed in the first of a raft of cases that could be overturned due to the involvement of undercover police. Lawyers for Andrew Clarke and Geoff Sheppard claim they were the victims of a miscarriage of justice when they were found guilty of firebombing branches of Debenhams. They will renew attempts to get the convictions overturned after a damning report by Mark Ellison QC published yesterday found that information obtained by undercover officers had not been disclosed to defence teams and therefore miscarriages of justice may have occurred. Former Metropolitan Police commissioner Lord Paul Condon said today "at no stage did I ever authorise, or encourage, or know about any action by any undercover officer" in relation to murdered Stephen Lawrence's family and friends. David Cameron has said a public inquiry into the work of undercover policing will "make sure we get to the truth". The inquiry was commissioned after a report into the police inquiry into the murder of Stephen Lawrence uncovered evidence of corruption. 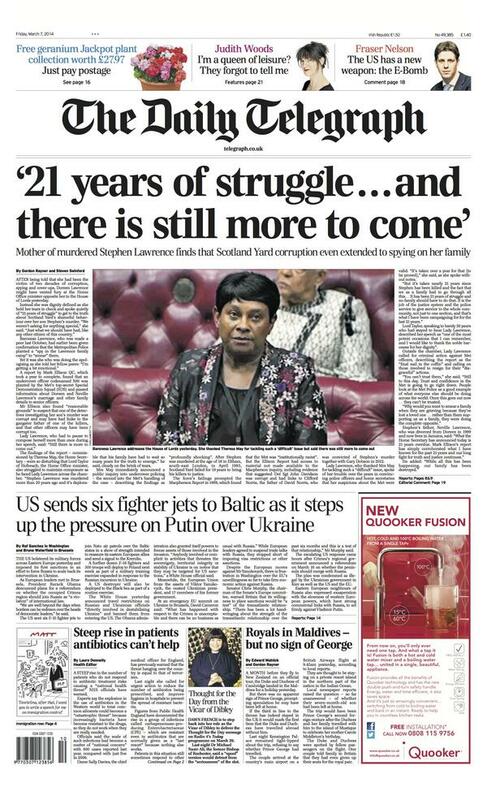 The Prime Minister added: "It should have not taken this long and the Lawrence family have suffered far too much." 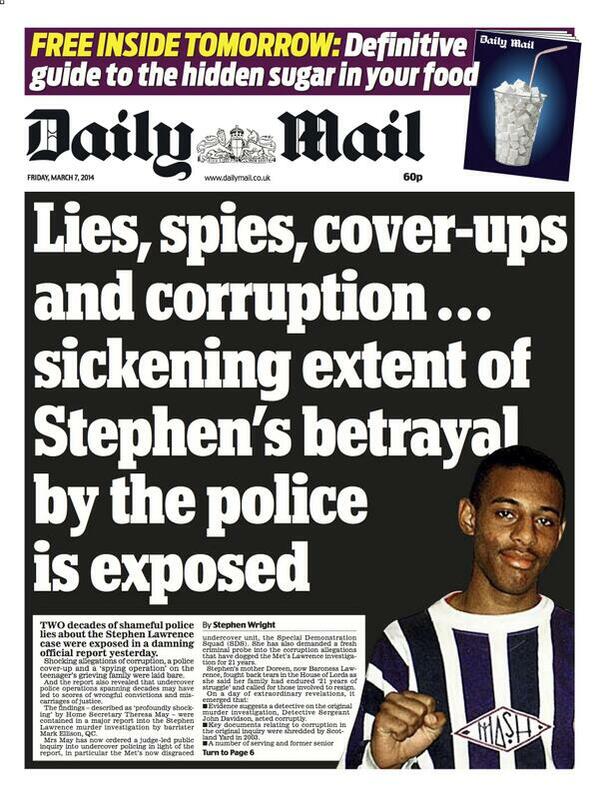 Several of today's papers lead with strong headlines after the report into the police inquiry into the murder of Stephen Lawrence uncovered evidence of corruption. The public inquiry announced today will examine the Special Demonstration Squad, the Metropolitan Police's undercover unit. It was set up in the 1960s to infiltrate protest groups. One former member has claimed he had been told to find information to smear the Lawrence family.